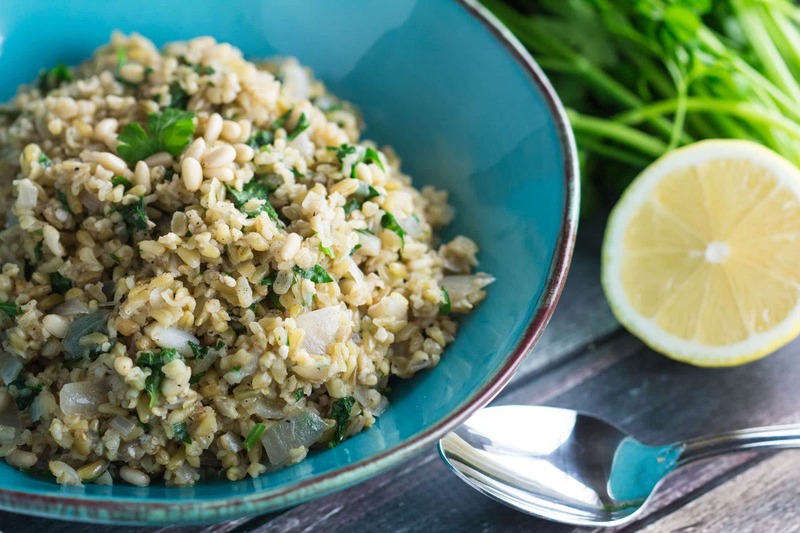 Freekeh Pilaf made with Mint, Pine Nuts and spices. First things first. Let’s clear the air on how we say this word. Freekeh (pronounced “Free-kah”). For about the last 6 months, I’ve been reading through some nutrition magazines and blog posts about this grain. It is an ancient grain that is gaining popularity in America mostly due to its nutritional qualities. If any of you are “quinoa’ed” out this may be your new buddy! (Quinoa is technically a seed though, not a grain). But don’t get me wrong, quinoa is still delicious and I cook with it often! It is high in protein, fiber, vitamins, minerals, and has a low glycemic index compared to most other grains. Glycemic index measures how a carbohydrate containing food raises blood sugars/glucose. It contains 4 times the fiber than brown rice! This is great because a fiber rich diet is linked to lower body weight! Freekeh will leave you feeling fuller longer. Freekeh can protect your eyes because it contains two antioxidants – Lutein & Zeaxanthin – which are very important for eye health. It can act as a prebiotic to increase healthy bacteria in your GI tract. **Freekeh is not gluten free for those of you with Celiac disease. Other superfood grains you may be interested in include: spelt, amaranth, couscous, and farro. Quinoa has 39.4g carbs, 3.6g fat, 5.2g fiber, 8.1g protein, 223 calories. Freekeh has 36g carbs, 0.4g fat, 8.2g fiber, 5.6g protein, 205 calories. Which is better? Well as you can see, quinoa has more protein per cup. It also is a better source of iron, folate, and calcium. It is also gluten free, which freekeh is not. 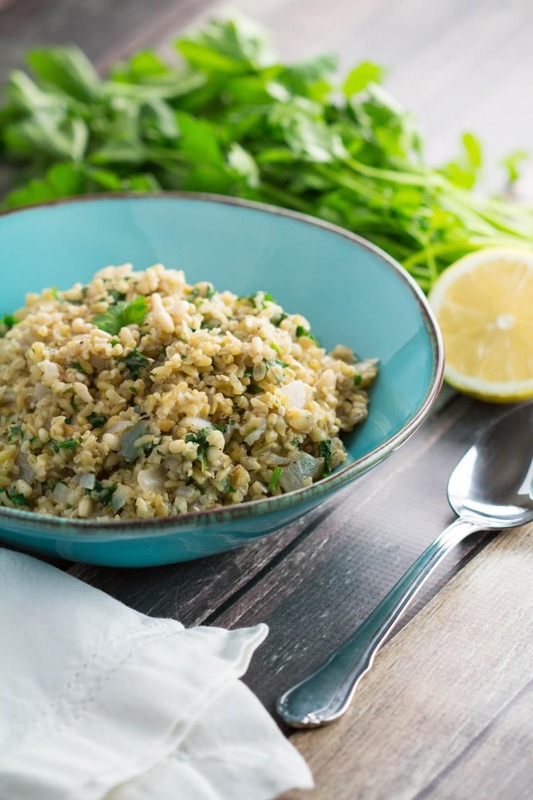 Freekeh has a lower glycemic index, making it a slow-release energy superfood. Higher source of fiber, and lower in fat, carbs, and calories! Since I’ve talked so much about it, I’d like to share a delicious recipe using Freekeh. I found my Freekeh at Whole Foods Market. 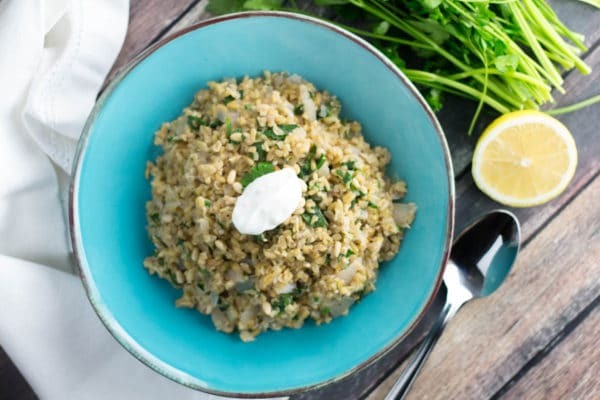 Freekeh Pilaf is a nutritious alternative to rice pilaf, full of fiber and protein! 1 handful of fresh mint, parsley and cilantro Chopped. Place oil, onion, and one clove garlic into saucepan. Sauté on medium heat for about 10 minutes, stirring occasionally. Add Freekeh to pot, and then add the cinnamon, allspice, coriander, salt and pepper. Add chicken broth or water and bring to a boil. Remove pan from heat and let sit for 5 minutes, covered. Then, remove lid and fluff with fork. Stir in herbs, mix well, and top with pine nuts! Wonderful alternative for rice pilaf! Optional: Mix together 3/4 cup Greek yogurt, garlic, and lemon juice and top on pilaf. Very tasty!! I encourage you all to try this grain out! wow, I love it! I am going to try that recipe! Thanks Tawnie! I definitely get burnt out on quinoa and this looks like such a yummy cure 🙂 Love the greek yogurt and lemon in it! Stunning! Such a beautiful dish and sounds so flavorful and nutritious. Going to have to give this a try! Mmm this looks great! 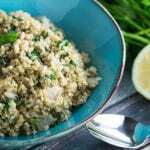 I’ve also heard loads about Freekeh, I need to try it out in 2017! What a great pilaf recipe! I love the flavor of freekah and did not realize that it had added benefits for the eyes and was such a great source of fiber! I need to fix this soon! This pilaf sounds wonderful! I need to get some freekeh STAT!